Forget about the stress and effort of purchasing bus tickets, museum tickets, and looking for local events! With the WinePass Guest Card (from 6 years) all this belongs to the past. Stress-free holidays are therefore guaranteed. The Guest Card is included in the rate of the apartment and is valid for the entire duration of your stay. 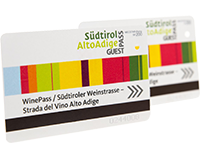 Be it wine or culture lovers or adventure seekers: our guests have everything included with the WinePass. One of the main attractions included in the WinePass is the use of the Mendel railway, which is only a 2 minute walk from your holiday apartment. Simply bring your WinePass and start on a comfortable hiking day to the Mendel. Or take the bus at the nearby bus stop to discover the regional capital of Bozen. unlimited use of public means of transport in South Tyrol: Regional trains in South Tyrol (Brenner – Trento, Mals - Innichen), regional buses (city buses, regional buses), the cable cars to Ritten, Meransen, Jenesien, Mölten, Kohlern and Vöran, the tram railway Ritten and funicular railway to Mendel, the PostAuto Switzerland between Mals and Müstair.